This is a brand new and unique web security course that takes the learner to the next level of web security. A perfect blend of latest and lesser known web attacks that are explained with ultimate details, accompanied by demos and “how tos” that you can apply in real world red-team pen-testing. The course curriculum is designed to include web attacks and techniques that are not much documented in books, trainings, courses and elsewhere along with the well known OWASP Top 10 web vulnerabilities. To make the course more effective and practical, a live CTF will be organized for the attendees to apply what they have just learned. This course is made in such a way to accommodate latest attacks as and when they are discovered or published on various conferences like BlackHat, DEFCON, OWASP AppSec etc. Basic scripting knowledge in Python is good to have. Full Administrative access and USB ports enabled. Identifying DOM XSS in modern JS MVC frameworks. 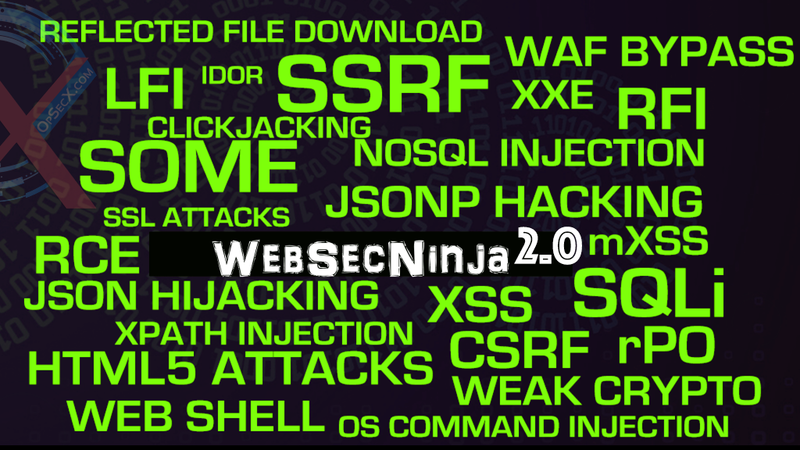 Creating tools to detect XSS, SQLi, RCE etc.